So in my last post I mentioned in passing that I was really loving orange lately. And I am. In fact, I've been itching to design the nursery in orange and...well, and something. I didn't want to do brown because it's too harvesty. I don't want to do just white because it's too monochromatic and modern for my taste. And then I saw the divine Ms. Tobi Fairley's feature in Traditional Home earlier this week as I paged through the magazine en route home from LA. And I fell in love. Aqua and orange -- that's it! It's fresh, young and fun but still sophisticated and interesting. And even more important: it's gender neutral. I've decided to eschew traditional gender decorating (for now) and go with a more neutral theme for a nursery. But back to these rooms....Tobi Fairley designed the master bedroom and adjacent sunroom for a Showhouse in Arkansas using predominately green materials (and plenty of antiques and refurbished furniture). And this may be about the freshest, happiest approach to reduce, reuse and recycle that I've ever seen. I'm particularly fond of how Tobi doesn't try and match tones too closely. 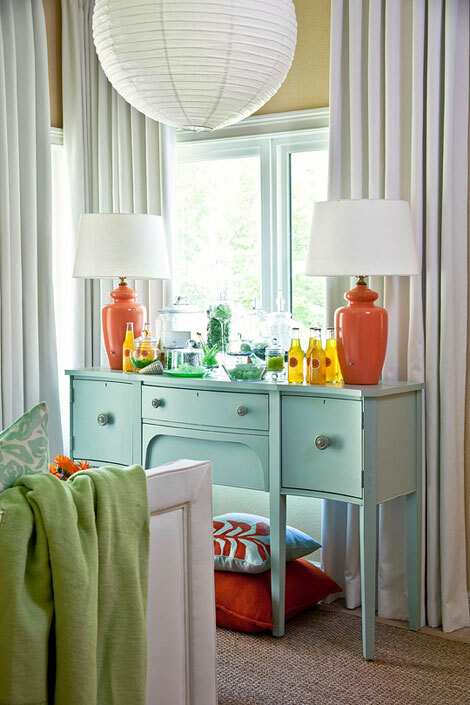 The aqua Rubie Green fabric on the vintage sofa isn't precisely the same tone used on the legs of the orange chair or on the finish on the cabinet. And I like that. The overall effect is more layered and less stuffy -- but still conveys the pulled together look that a tighter color palette can give you. Also love how there are only two throw pillows on the sofa and none on the armchair. Much as I love a throw pillow (and you know I do), I get tired of seeing designers completely cover furniture in them. It's impractical and they'll only end up on the floor. Mmm...pretty lamp, pretty flowers, pretty curtains. All around great styling generally and I appreciate that this nightstand isn't completely cluttered with stuff. All too often these vignettes just read as overstyled to me. Here, Tobi sticks to a classic group of 3 (I consider the orange book more of a stand than an object itself) with staggered heights. It's a simple formula, but it always works. 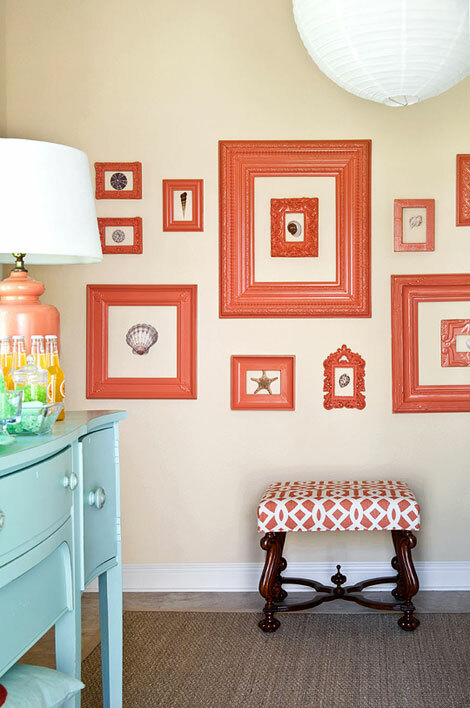 In the sunroom, Tobi painted mismatched vintage frames the same coral shade and displayed simple shells within, treating them as shadow boxes rather than traditional frames. This a trick that's been used to great effect by a number of designers -- and even on HGTV, but I still like the look. It's a great and inexpensive way to fill a big wall. And of course I love the hit of KWID Imperial Trellis in that great spice colorway. So yes there are a lot of throw pillows on this daybed, but I make an exception for daybeds as they're deep enough both to accommodate a plethora of pillows and a person (or two), especially if they're backless as here. The embroidered teal pillows are particularly gorgeous -- would love to know the source if anyone knows it. But is it just me or does that art look an awful lot like a chalkboard? Those lamps are actually old flea market finds that Tobi painted orange -- brilliant trickery for decorating on a budget. I also have to add that the Izze orange sodas displayed on the makeshift bar are personal favorites of mine. I've been drinking it regularly since I found out I was pregnant in an effort to stave off the boredom that comes with abstaining from alcohol and diet soda. Such great inspiration! I love the lamp in the third picture. And I totally agree about how the close, but not an exact match, tones work well together. I sometimes find myself trying to match things perfectly, but need to remember that it doesn't have to be exact to still look good. Averill, I too love Tobi's design work. That bench, the daybed with the orange throw and fabulous art, the silver gilt frames, all of it! Fun and fresh! Fun colors! Daydreaming of a weekend getaway here! The adjectives you picked to describe Tobi's design, fresh and happy, are perfect and exactly what I love! These rooms are going in my inspiration files, stat. And I can't wait to see how you design the nursery, it will be fab! I came across your post this afternoon while browsing interior design blogs and the topic of window treatment selection was very interesting to me. I love the window treatments in this house, they are stunning. It is true that you must dress your windows appropriately to bring out their true beauty. Thank you for writing and as a special thanks to you and your readers, I would like to offer a 20% off coupon using this code upon checkout: BLG20. Oh I feel your no-alcohol and no-diet soda pain! That was such a pain! And Averill - OMG I LOVE LOVE LOVE this post and these rooms. I'm in heaven. Gorgeous! You know I love aqua (Cal's room) and orange (Fi's room) and have them all over our house. If you really end up decorating your nursery in those colors I might have to fly to Houston for your shower just to see it in person. HAHA! Stalker much?! But seriously I can't wait to see what you do, and I even want to dedicate a post to it on my blog, when the time comes! These inspiration rooms are gorgeous, and your post is so informational. I LOVE IT! Yes, orange + aqua = LOVE! I have looked at these pics so many times already! And, such a good post to put with them...thank you! Don't you love when that happens? I think aqua and orange will be a fabulous color combo for the little one's first pad. Have a great weekend, love! You beat me to it! :-) I just saw these rooms the other day too and saved them for a future post. I'm with you on all of the points you made. I love what she did here! I think a nursery in this scheme would really be fun. Can't wait to see what you do. What a perfect color combo for a nursery (or any room for that matter!). It will be great, I know! Tobi is brilliant! 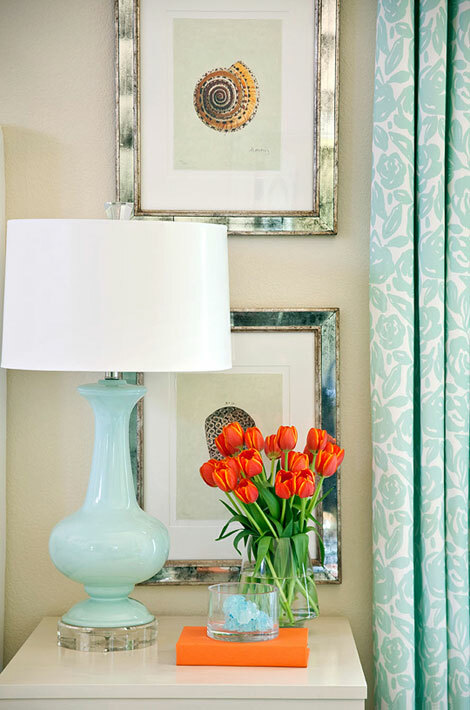 Love how she painted those mix-matched frames and lamps. Love it. Averill, I love this color palette and it is perfect for a nursery. Perfect!! BTW, Tobi is so talented...I need to find some of the sources for the paint colors she used. Anyway, I love what she did and can totally envision a nursery in this color palette. I used a same color palette for my BF's baby shower (but, I threw in fuschia & chartreuse) as well. I love this color combination as well. I agree about the tones not exactly matching! You have to be brave and say I know this is going to work! Stop by Pemberley if you have time. I just posted a fall wreath giveaway. Really cool color combo, darling A! I loved this feature and also the color combo. I think I used pops of both in one of the mood board parties a while back. Exciting this is the direction you plan to take with the nursery...cannot wait to see what you do. I finally found a crib this week and am waiting on finish samples so I can order and just bought an old dresser to double as a change table at a barn sale locally this am. Feels good to be planning...and in my case, better late than never. Enjoy your weekend. What a fabulous choice for your baby's room. Very fresh and visually stimulating! I adore Tobi's work here as it is realistic, plus she's a great lady. I love your idea of using these colors for baby's nursery, brilliant. Not cliche' and extremely happy. OMG! These are the colors I'm using to decorate my bedroom as we speak. This is so neat! Averill, I think this is a fabulous idea! Not only will it be refreshing, but very flexible. When the little one gets old, he or she will have some great pieces and can certainly add a beautiful fuschia and deep plum, or grey... the possibilities are endless! I bet you must be so excited! These are colors I'm using for our bedroom and bath as we speak! Thanks for sharing! What a nice light and bright touch with these colors. I confess to having grown a bit weary of Imperial Trellis, but it looks fresh again in orange. Oh what lovely images. And yes orange is slowly becoming a fave color for interiors these days... and why not? orange gives such a cheerful and vibrant feel. I love it too! I posted on an orange/aqua/gray fabric board for a child's room using Spoonflower.com. I am so thrilled for you on your news! Such a special time in your life. Love this colour mix. So happy! Oh yes please- I will take this color combo anyday of the week, I just love how bright and happy it feels! Tobi has such gorgeous taste. I love that color combo and think it will look awesome in a nursery. I love anything that's not the traditional powder blue/pale pink/sage green. Oh how I love this color combination. What fun colors to decorate a nursery with and very gender neutral, no? Love it! 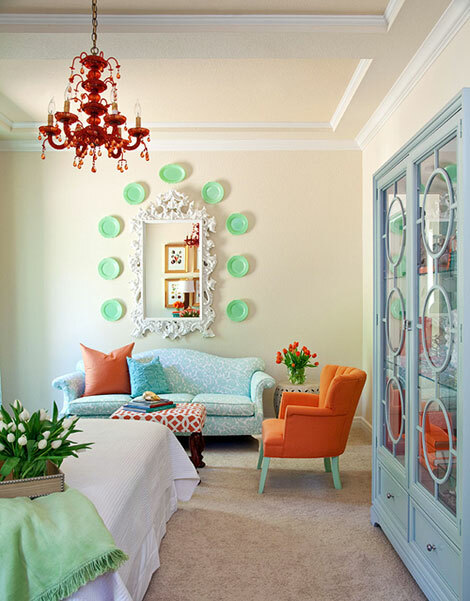 I plan on doing coral and turquoise for our guest room/office (whenever we get our acts/budget together for it). 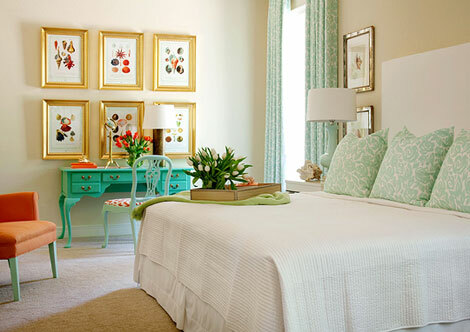 I think I love turquoise with any color - great inspiration images. Are you kidding? Tobi is the most "matchy-matchy" decorator out there. Yes, her interiors are pretty, but they lack a personal feeling, and most importantly, look like they were done by a "decorator."